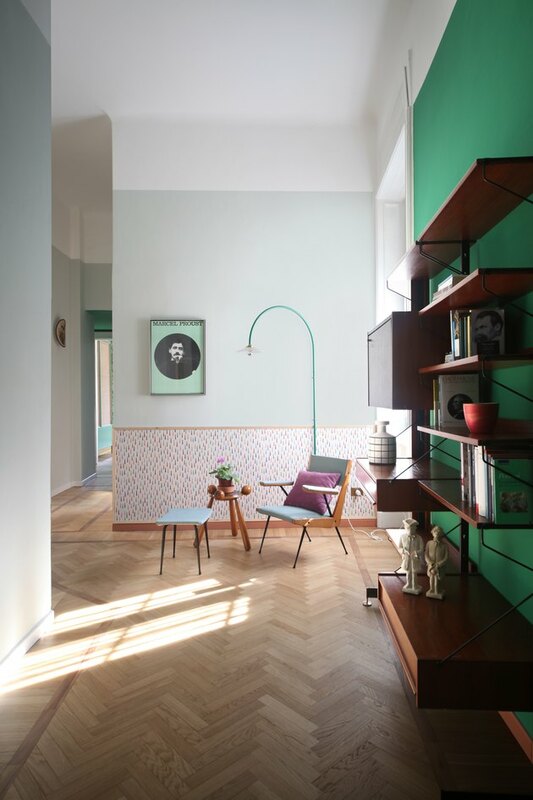 For all our talk about "dream houses," it's clear we didn't even really know what that would look like until we saw this unreal apartment in Milan designed by Andrea Marcante and Adelaide Testa of the architectural studio Marcante-Testa. 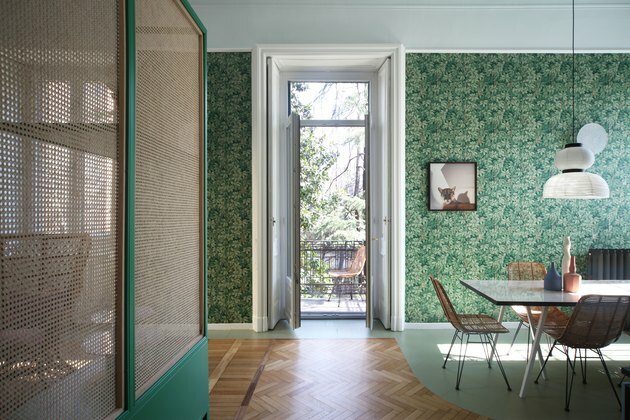 Through unexpected uses of paint, vintage and custom furnishings, and surreal wallpaper, the home feels sort of as if Wes Anderson did a remake of The Secret Garden (and set it indoors). The team's clever use of cane, wicker, and wood frames the botanical prints throughout the home in a way that truly makes the space reflect a sense of nature. So, when can we move in? A reading nook is complete with a vintage bookcase and midcentury Carrozzeria armchair. 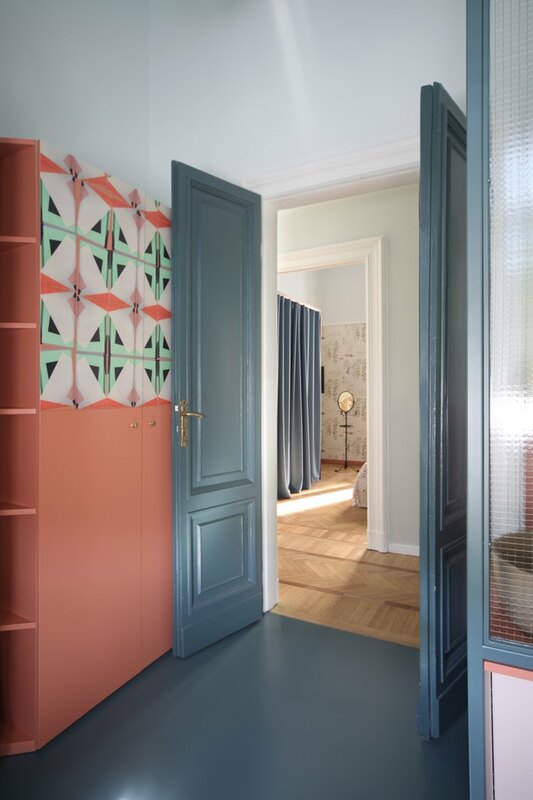 A Maharam wallpaper ("Showers by Alexander Girard") wainscot brings a bit of playfulness to the corner, while a Muller Van Severen wall lamp lights up the space. 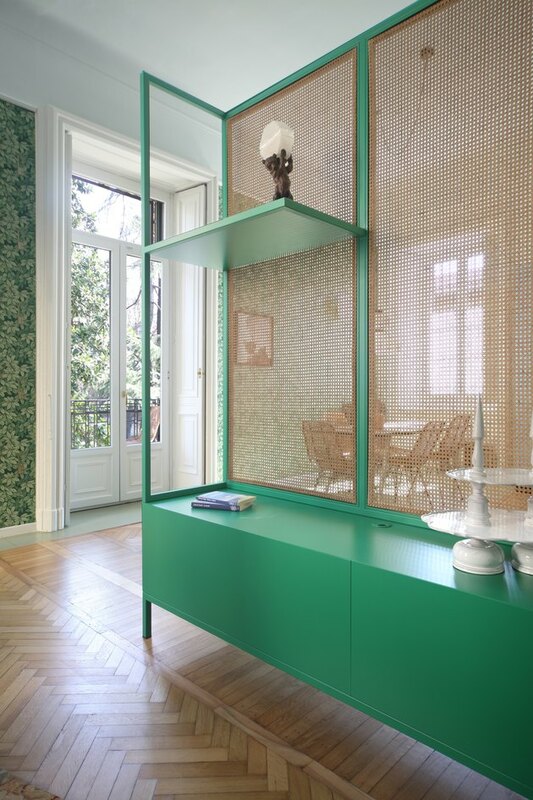 A custom cabinet with cane paneling acts as a brilliant divider, separating the living and dining rooms. We especially love how the natural material geometric details of the caning play so well with the lines of the herringbone floor. 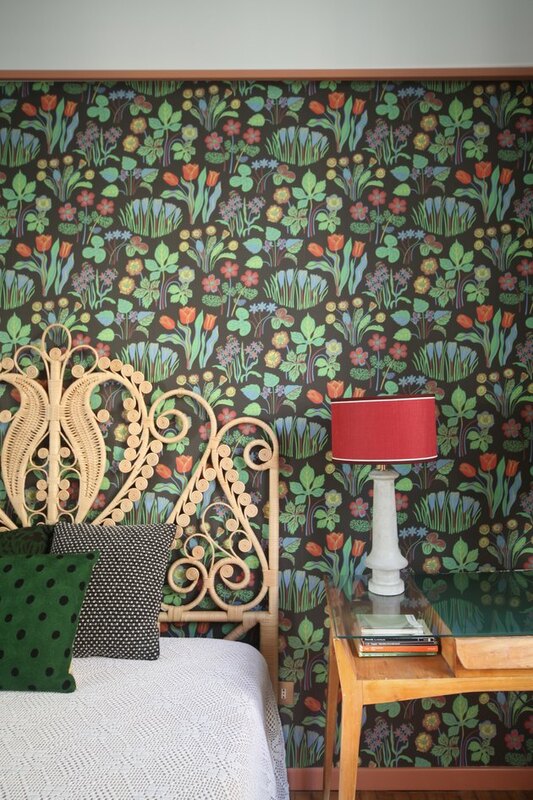 The view of the outside courtyard is framed by Fornasetti wallpaper from Cole & Son. A custom-made table was created by using a marble-looking laminate by Abet Laminati with table legs by Hay. In the living room, a sofa by Arflex is paired with a vintage 1950s rattan wicker chair by Gio Ponti. A small side table by Classicon functions as a coffee table — which, tbh, is a pretty smart space-saving idea. There's an unexpected juxtaposition throughout the home. The living and dining room draw on traditional motifs while some adjacent spaces feel more contemporary. The kitchen for example, uses sleek fittings and a blue-red color combo that could feel like a dated European design. The team custom-designed a wardrobe for the bedroom using a metallic structure. In the bedroom, a rattan headboard by Maison du Monde feels less boho and more Victorian. 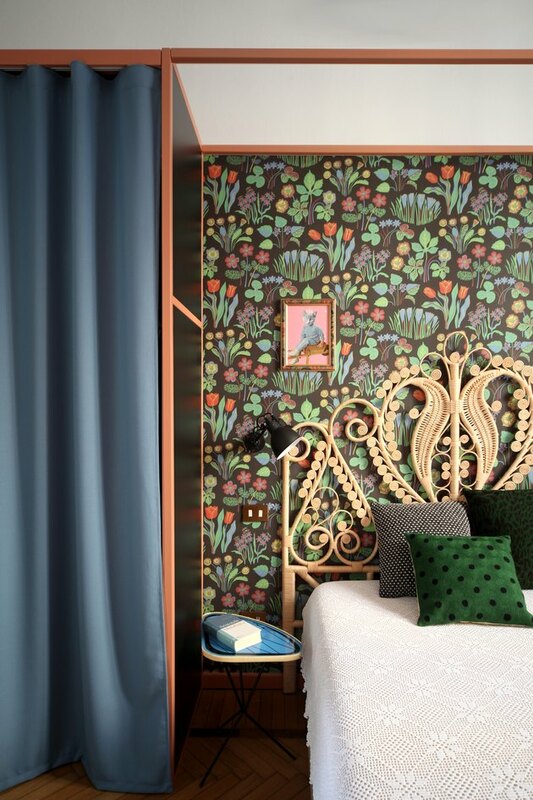 Wallpaper by Svenskt Tenn creates a dense and dreamy backdrop. 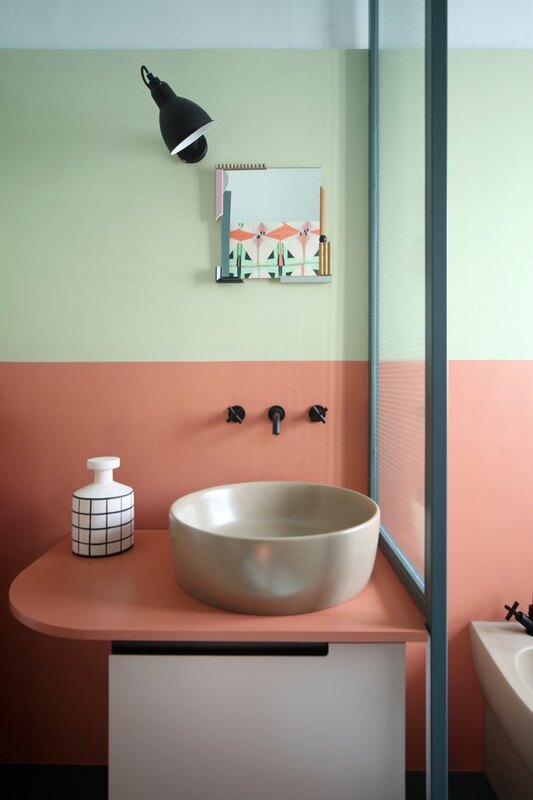 There's a subtle '80s aesthetic in the bathroom, with bright color blocking, a grid-patterned soap dispenser, and a curved countertop. Paints by Farrow & Ball were used throughout the apartment. Resin floors here and throughout the home were made by Rezina.